(1) I raise my eyes to the mountains. From where will my help come? (2) My help comes from Jehovah, The Maker of heaven and earth. (3) He will never allow your foot to slip. The One guarding you will never be drowsy. (4) Look! He will never be drowsy nor go to sleep,The One guarding Israel. (5) Jehovah is guarding you. Jehovah is the shade at your right hand. (6) By day the sun will not strike you, Nor the moon by night. (7) Jehovah will guard you against all harm. He will guard your life. (8) Jehovah will guard you in all you do From now on and forever. The Lord’s dear people never needed help more than at the present time. The difficulty with some, however, is that they do not realize their need. “Wherefore let him that thinketh he standeth take heed lest he fall” (1 Corinthians 10:12). “Let us fear, lest a promise being left of entering into his rest, any of you should seem to come short of it” (Hebrews 4:1). Look to the LORD GOD for it—not relying upon their own strength or wisdom nor upon the assistance of their fellows. We are not to despise assistance from any quarter, but our chief reason for receiving any assistance should be our conviction that it has come from the Lord, whether through the ear or through the eye and the printed page or however. We are to remember that we are contending against a great Adversary and wily foe, and that we are not sufficient of ourselves to conquer, but that our only HOPE is in abiding in the Lord’s love, by seeking to do those things which are pleasing to him and heeding the counsel of his Word and the leadings of his providence. A little carelessness along these lines, and the Adversary might readily entrap us and ensnare us and then lead us captive at his will. Ah, yes! we have the assurance of the Lord that there is but one place of safety at this time—into which more and more deeply we penetrate day by day. This place of safety is under the shadow of the Almighty, which figuratively signifies very close to the Lord. “No harm can come nigh that dwelling place,” so far as the New Creature is concerned. Trials, tribulations, slanders may be exercised against us according to the flesh, but these cannot harm us as New Creatures, nor even disturb our peace of soul, while we are close to the Lord. Our thought is that the evil spirits have been restrained in considerable measure from intruding upon the minds of men. Otherwise the world would have become Bedlam long ago. But our thought now is that their liberties with the saints will be increased, with a view to the closing test or decision in respect to character, which is now due. “Judgment must begin at the house of God,” but it is to extend in this hour of temptation or trial to “all them that dwell upon the face of the whole earth.” That which will begin with the Church will end with the world, producing the most awful state of affairs imaginable, “A time of trouble such as never was since there was a nation.” (Daniel 12:1.) This power of intrusion will contain, we believe, evil suggestions, promoting slanders and back-biting and temporarily, at least, derange the judgment and lead to violences of various kinds, of which the same person, under other circumstances and conditions would not have thought. In a word, the difficulty will be a dementia of passion, strife, hatred and unreason. We see evidences along this line at the present time and it is our duty to sound the warning for the benefit of those not already so twisted as to be unable to appreciate the situation. Such manifestations of evil spirits—malice, hatred, envy, strife, evil-speaking, back-biting, slanders, etc., circle around the VOW and those who have taken it, with violence and opposition for which we cannot otherwise account. Those under this influence seem impervious to argument, to reason, but open to every imaginable suggestion of evil. They seem to lose entirely the spirit of love, the spirit of Truth, the spirit of a sound mind… It bids us have sympathy for the deluded ones and be on guard for ourselves. Desiring God’s rule more and more in our own heart, and asking God to keep us humble and in reverential fear to His will lest we should attempt to grasp something which the Lord had not put into our hands. More carefully than ever, guard every thought and word and deed to avoid every high imagination and to keep us from saying or writing unkind words. Strive to daily remember the harvest laborers and to consider our privileges in the harvest work by filling our mind and hands with the work the Lord had already committed to us. Be on guard against Spiritism and Occultism in every form. After what we have witnessed of the power of evil operating in the minds of some and producing characteristics which the Apostle denominates “Works of the flesh and the devil,” we can scarcely be surprised at anything which the Adversary might accomplish along these lines. But while we fear lest we should come under any such influence ourselves, and while we watch and pray lest we enter into temptation, we should not be cast down, nor hindered in any measure or degree, in respect to the service of our King. So then, while still expecting the attacks of the Adversary along the lines of materialization, hypnotism and occultism in general, we perceive that from inoculation of our minds with evil surmisings, saints have probably the most to dread. How can we be on guard against this insidious snare? By keeping very close to the Lord. The least deviation from the principles of righteousness in our thoughts, the least violation of justice or love in our thoughts, would open the way for the enemy to inject poison, leaven, malice, envy, hatred and strife. Let us remember Psalm 121 and lean on the Precious Promises striving to continually “think on things above” and rest in the shelter of the Most High. Br. 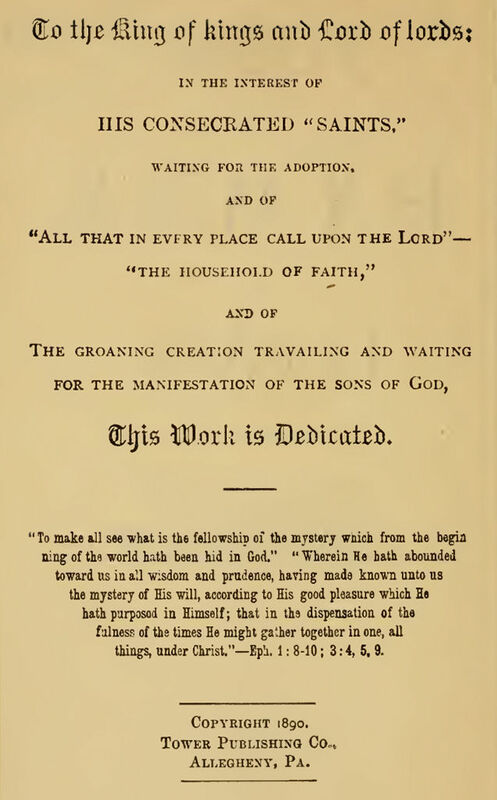 Charles Taze Russell—Reprints of the Original Watchtower and Herald of Christ’s Presence.